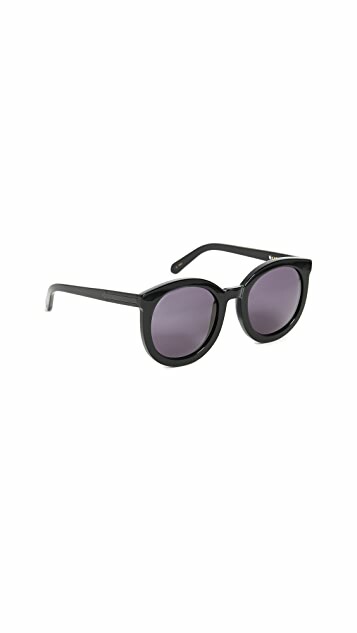 Thick plastic frames outline these oversized sunglasses, etched with arrows at the temples. Case and cleaning cloth included. This sunglass looks oversized on my face, thus makes my face looks smaller and also fashion. However, the flame is a little awkward just as previous review. It cannot fold unless you fold the left one first. Otherwise, the rest part is good. 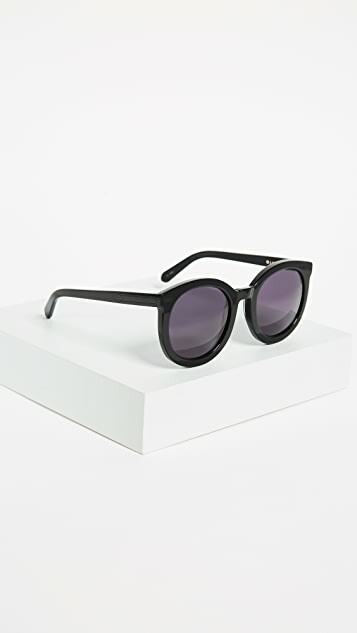 The glasses are very beautiful,but the box is broken. I love these sunglasses. 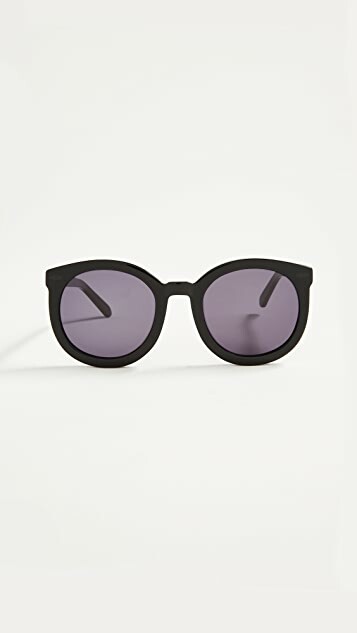 I don't think they are too big, you pretty much should know what you're getting when you look at the pictures, I wanted a large pair of solid black sunglasses and that's what I got. 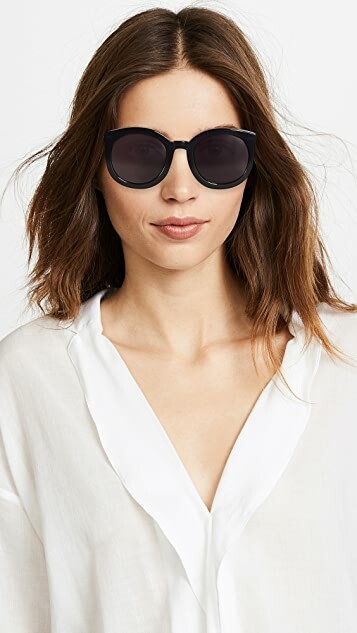 I love the subtle blacked out Karen Walker Arrow, I find it less flashy than the in your face Gold logo. Bought these sunglasses but had to return them. They had a few lines on the side, didn't look sleek. They were also too heavy. Looked stylish and beautiful though. Not quite fit asain but my Aussie friends were bloody love it haha. 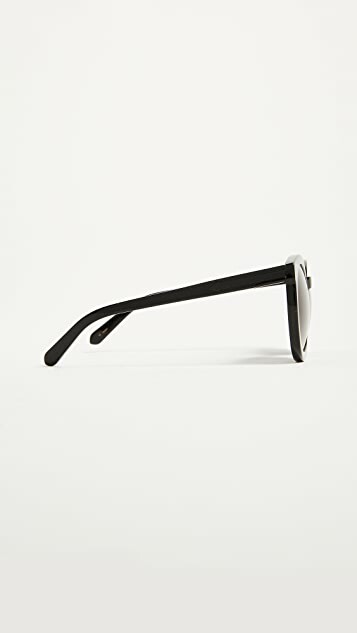 Cause this one is a bit flat so that requires a high bridged nose, not very comfortable but still looks good on me, makes the shape of my face smaller and cool! This sunnies been out for while ago, however it is still in style. 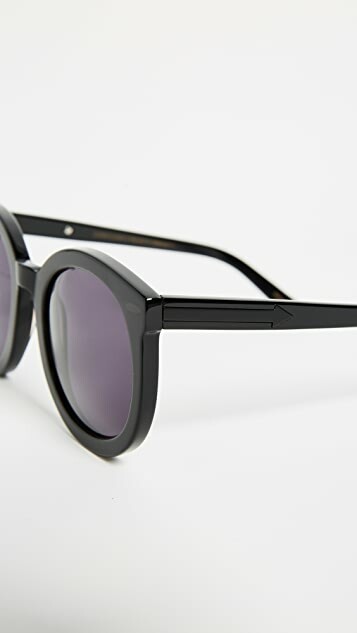 Lens are big enough to hide from uv rays, the design is kind of funky but with this black color, it somehow look simple so going well with any outfits. I also own turtoise one, but thyis black one goes better for me. sooooooo nice!! like it so much!